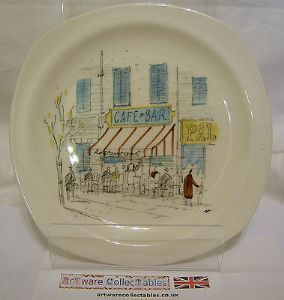 An excellent opportunity to acquire up to 6 Riviera design plates manufactured by the Midwinter Pottery. This plate measures just about 6.25 inches (15.5 cms) in length with a similar width. Each plate has been part of a previously owned dinner service though they are in perfectly good condition with only some evidence of light crazing. We would be willing to discuss an overall cost for any number should any buyer be interested in more than 1 piece.